The terms “centerfire” and “rimfire” refer to the type of ammunition a particular firearm dispenses. Anyone into firearms (regardless of experience) has certainly come across these terms at one point in time. This article explains the differences between the two. Its cartridge’s primer is in the middle of the cartridge’s rear end. Primer lines the cartridge’s rim. In a centerfire rifle, the firing pin strikes the circular primer located in the center of the ammunition’s rear end. A primer is a metal cup which contains a primary explosive inserted into a depression in the center of the cartridge base. When the trigger is pulled, the firearm’s firing pin crushes this explosive, producing hot gas and a gush of incandescent particles. This process ignites the powder charge that shoots the bullet out of the firearm’s barrel. Centerfire cartridges are made of thicker metal which is considered more dependable for military applications because of its durability in rugged environments. It is also safer because a centerfire cartridge is less likely to get accidentally triggered by impact when dropped. The base of a centerfire cartridge can withstand greater pressure, allowing a bullet more velocity and power. The separation of the primer from the cartridge means stronger brass casings can be made and more powder can be added for larger, longer-ranged, and more powerful projectiles. Casings from centerfire ammunition can be reloaded after firing simply because the casing is left intact after firing. In rimfire rifles, priming compound is applied and spun into the rim of the cartridge casing, thus making the primer not readily visible. The firing pin of the rifle hits and crushes the rim of the cartridge’s base, which consequently ignites the primer on one side of the cartridge. This action may result in an uneven powder burn. The rim of the cartridge is basically a larger percussion cap, while the cartridge casing holds the propellant powder and the actual projectile. When the rim of the cartridge is struck and the projectile is fired, the base is deformed by the impact of the firing pin. This leaves the cartridges no longer usable. Rimfire cartridges are manufactured with thin casings to allow the firing pin to easily crush the rim. The low pressures required in manufacturing rimfire cartridges means lighter and affordable, rimfire rifles and inexpensive cartridges. So what’s the difference between centerfire and rimfire rifles? 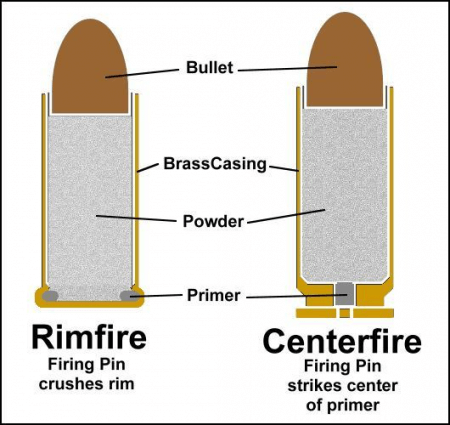 The biggest difference to consider between center and rimfire is the manner in which their primer is ignited and where it is located at the base of a cartridge. The primer on centerfire ammunition is found in the center of the casing’s base. It is a separate, self-contained piece of the ammunition. The firing pin crushes the primer, causing an explosive reaction that propels the bullet through the barrel. Rimfire ammunition has its primer built into the casing’s rim. The firing pin hits the primer, crushing the casing which ignites the gunpowder. This fires the bullet out of the firearm and renders the casing unusable after firing. Gun experts agree that this feature makes rimfire vulnerable to manufacturing flaws which can cause misfires. Centerfire ammo is more expensive and complicated to manufacture. Its metal casing is made thicker to allow more firepower and reliability. Also, centerfire cartridges are reusable and can be reloaded with the right set of tools. Although rimfire cartridges are non-reuseable, they are simpler to manufacture and cost much less than centerfire. Who better to hear about centerfire and rimfire ammunitions but from a firearms expert himself?